Time for the playoffs and Tailgating Time week # 20 - The the play offs continue, and so does good food, and a pitcher full of cold ones! Everyone is getting ready with some great ideas for The Super Bowl! Bring over your famous recipes for you favorite foods and party things! It has been awhile since we had Mexican fried cheese so I thought I would bring it to Tailgating Time. I love cheese, I mean a real cheese fanatic! So when I discovered a cheese you could fry without all the hassle of breading and deep frying. I'm there! This is a perfect weekend snack tailgating or not. Okay...It's good any day of the week. I bought some Mexican frying cheese, it's called Queso De Freier. Just slice it in finger size slices. I did brush a little oil in the pan just to make sure it didn't stick. Let it get a nice golden color before you turn it. I know...how can you tell it's golden until you turn it. Well let it fry on medium heat for a couple of minutes, it will release fairly easy once it starts to brown. Turn it on all sides, watching it the whole time so it won't brown too much. When you remove it from the heat place it on a paper towel to absorb some of the excess oil, if any. Serve it with salsa! It has a slightly salty, mild flavor. Crispy on the outside an nice and soft on the inside. Perfect for snacking! It also tastes good with your favorite fruit preserves. 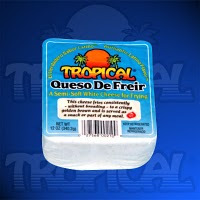 Edited to add: I found out that the queso de freir cheese is from Dominican Republic, I thought it was Mexican because it was there with the queso blanco and queso cotija cheese. So I probably should rename it to Caribbean Fried Cheese! See I got it a little too brown, but I liked it anyway! Hope you enjoy it! We did. We always appreciate our loyal friends who join us each week, and welcome those of you who are new to us!! Come on and have some fun! it's easy, just add your recipe to the linky, and link back to us! God BLESS you for this one! I have never had fried cheese and know both myself and the man I married will love this! I want some of that fried cheese Lyndsey! I love cheese! I am always happy to discover a Mexican cheese I did not know about! Thanks for this and this dish reminds me of halloumi. Fried cheese?? Omg, that sounds so good. I'd be afraid to even try it because I'd eat it always. I like mine a little extra brown too. I looooooove fried cheese! Have you ever tried halloumi (the Greek version)? It is awesome. 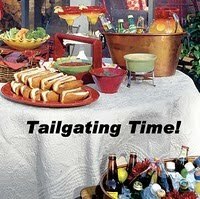 I am learning something every week with your tailgating parties; never heard of this but it sure looks and sounds great. I've never seen that before. I'll have to search it out my next grocery trip. Thanks for sharing and hosting this party. If ever there was a reason to fry cheese - you have just given it to me! I love Haloumi and so may have to pick some up as a treat. The cheese with salsa looks great. Those fried cheese looks fabulously yummy!! I love fry cheese....I use the same cheese to make Colombian cheese sticks. Fantastic! Moan. Fried cheese. You speak to my soul. Sounds like perfect Super Bowl food. Where did you buy Queso De Freier? Lyndsay: Of course you're a cheese lover like me! :D You'll enjoy this! tasteofbeirut: yes it does remind you of halloumi. tigerfish: it does brown up nice, I like the texture when it's fried. Betty Ray: I know what you mean, luckily my daughter eats most of it. HH: yes, I love it too! Yum...cheese! Rita: I glad to hear that! This is such any easy way to prepare fried cheese! laxsupermom: you're welcome, thanks for stopping by. Pru: don't mention it, happy to enable you! LOl! Erica: I'll bet your Columbian cheese sticks are great! Claudia: great! I would be happy to see you, it sounds wonderful! Barbara: I can find this cheese at Walmart and Save-a-lot. Probably other markets as well, it with the Latin or Mexican cheeses. I have never heard of queso de freier before. It's great to learn something new. Thanks! I'll have to ask around and see where I can find it in our part of Mexico. Wow - ths is just a whole bunch of YUM!